Both skeins have a secret: they’re specially dyed to be perfect for knitting contrast heels and toes into your socks! In fact, this Uru.Yarn base is called Heels & Toes, and is dyed on our 80% Superwash Merino, 20% Nylon sock yarn for added squish and durability. The green, Compact, is perfectly highlighted in our featured pattern from the month, designed by Knitcrate’s Chief Creative Officer, Hannah Thiessen. Hyla is a basic sock with tailored touches: afterthought heels, arch shaping, and two-at-a-time construction make it a breezy knit you’ll reach for time and time again as your new favorite classic sock. It is fully customize-able for different foot sizes and is graded for three widths. 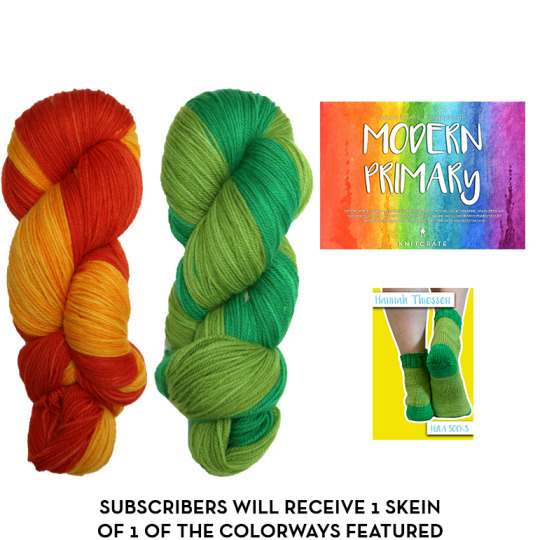 We know you’re going to love this month’s Sock Membership Crate, so be sure to join us for even more fun and excitement on the Ravelry group, where we’ve got a member-led knit-a-long to help you find your way through this fun pattern. See you there!